Several years ago, YouTube was shell-shocked in views as two identical twin sisters, Camille and Kennerly started sharing their harp duets with the world. 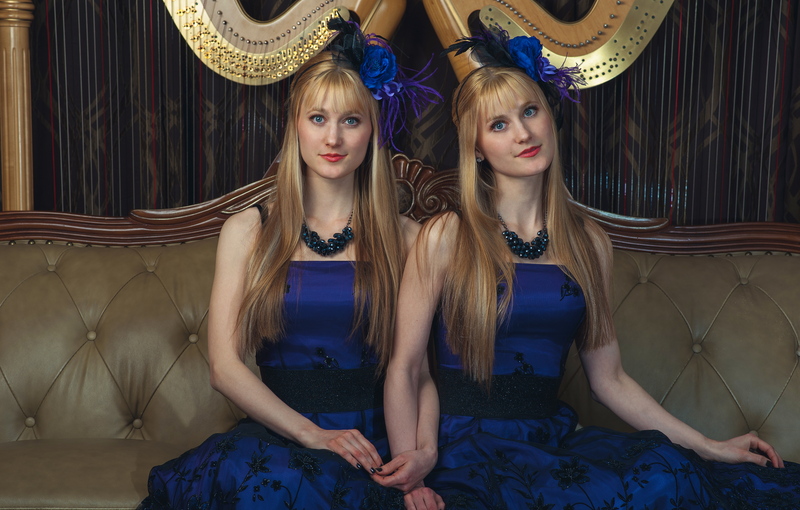 Since then, The Harp Twins have astounded fan and critic alike as they cover popular songs in metal, video games, and movies and TV. Not feeling content to follow traditional classical style music, The Harp Twins have created a whole new style of beauty and complexity in classical music as they continue to push the boundaries of music by working together on some of the most riveting songs you will hear. Recently I got to speak with The Harp Twins and ask them questions about their start, and practice habits and more fun things in between. Below is a transcript of our discussion together. James West: When did you start learning an instrument? Camille & Kennerly: We don’t remember exactly how old we were when we started learning an instrument, but we think we started piano lessons when we were about 8 years old. Our family couldn’t afford an actual piano, so we played on a touch-sensitive keyboard. We continued piano/keyboard through our high school years until we were able to validate out of our piano requirements at our conservatory of music studies for college. We started playing harp in middle school. We were both really drawn to the beauty of the harp. It’s always seemed like a magical instrument for us. However, it took us a while to convince our mom that we were serious about learning the harp. We had to show that we were serious by earning “harp money” ourselves. We babysat, walked dogs and did office work to earn the money to buy our first harps, which were pre-owned. James: From experience I play music with my brother. Do you feel playing together makes your music more special? C & K: We think so! Playing together makes our music more special to *us*. From the moment we started playing harp, we wanted to play duets. Life is more fun together, so it’s natural for us to have more fun playing music when we’re playing it together. We play harp together in a very intuitive way. James: Do you practice playing together daily? If so, what are some suggestions for other musicians to keep their skills sharp? C & K: Consistent practice is vitally important for any musician. Long practice sessions are not necessarily more beneficial than short, but focused practice sessions. When we feel our minds getting “tired”, we take a short breather and come back re-focused. When we are first learning a new piece, we first learn our parts separately and then put them together. So, we won’t necessarily practice together every day even though we are both practicing. However, every day that we’re not traveling or performing, we’re practicing. James: I have to ask. How heavy are the electric harps you carry in your videos? C & K: Our electric harps are 16 lbs and about 4 feet tall. So, they’re bigger than most instruments that someone would play strapped on! We often bruise our hips when we’re filming a video or performing for a long period of time. James: How has promoting your music through YouTube changed your careers as musicians? C & K: When we first started uploading videos to YouTube, we didn’t expect an audience, we just wanted a place to send potential clients so they could visualize our performance material. We also wanted people who had seen us perform live to have a place to go to see and hear our music again. We had no idea that in a few years, we would have an online audience from all over the world! YouTube has definitely been a wonderful outlet for us to show the world what we can do with harps. We have now had a lot of “real life” performances come from people finding us on YouTube. So many people find us on YouTube who would never have previously been able to hear our music. We’re very grateful for the opportunities that YouTube has provided us. James: With all the unique songs you pick where did the idea for heavy metal and videogame song covers come from? C & K: We generally play the music that we like! When we were studying classical harp music, we wanted a way to play the types of music that we most like to listen to. We couldn’t find contemporary arrangements for one harp – let alone two harps – so we started to teach ourselves to arrange. The first contemporary song we arranged was “Hey Ya!” by OutKast because our mom loved that song! By the time we were majoring in harp at college/university we were sneaking our rock arrangements into our recitals. Our favorite genres are rock, classic rock, and metal, and we also enjoy “fantasy” genres. As we’ve progressed in our arranging skills, we’ve been able to take-on some much more difficult songs, like Iron Maiden’s Dance of Death and others that are also very challenging. We have a very eclectic taste in music and we think that if someone goes to our YouTube channel, they are likely to find something they like no matter what genres they prefer. James: Do you play games? If so, what are your favorite games? C & K: Unfortunately our current travel, performance, and rehearsal schedule doesn’t allow us time to play very much. However, we love playing gaming music and it has a huge nostalgic value since we grew up with our friends playing games like Mario and Zelda. When we were young, our family didn’t have gaming systems since we didn’t have a lot of money, but we played on our friend’s systems. Newer games (The Elder Scrolls, etc.) have evolved to have more seriously “epic” music! We definitely plan to cover more gaming music in the future. James: If you could have someone play as a guest on one of your songs who would it be and why? C & K: Hmm That’s a hard one, but we’d probably pick the guys from Iron Maiden because of their complex melodies. But we would also be thrilled to even be a guest on one of their songs or a guest on any of the other bands we have covered! James: Thank you so much for speaking with me. Is there any message you want to give to fans? Friends? C & K: Thank you SO much for your support of our music and us! We have the best fans in the world and we cherish each and every one of you! Please stay tuned. We will continue to cross styles, genres, and decades and take our harps where no harps have gone before. Music is such a special form of expression, whether through a distorted guitar or a 16 pound harp, music finds a way to resonate with us and give us a connection to the world even if we don’t always see it. The Harp Twins are very special musicians who prove that your instrument can truly play what you want it to play. With hard work and determination to practice, these girls show us an amazing example of making music our own no matter the genre or composition. I would like to thank the Harp Twins and encourage all the readers to check out their YouTube and Facebook for all updates and musical goodness! Kind words Courtesy of Camille and Kennerly! Camille, Classical, Contrast, Control, Feature, Harp, Interview, James West, Kennerly, Music, Twins. Bookmark.